If you want to buy one of the best indoor electric grills then you can do so by reading the honest reviews given in this article which you can access by scrolling down. What Makes an Electric Grill Desirable? What to Look in an Electric Grill? All these are 5 of the top indoor electric grills available in the market right now, so it won’t be easy to choose one of these, in that case you can in-depth reviews with pros & cons of each grill, in the section given below. Here you can read complete overview of the product as well as pros & cons so that you can understand both positive & negative points of that particular grill that you are looking to buy. George Foreman is a popular name in indoor and outdoor grills, supported by the champion boxer. More than a hundred million of these grills have been sold worldwide. This 15-serving electric indoor/outdoor grill is a stylish addition to the standard clam-shell designs that the company manufactures. It is a large grill that you can bring out onto your kitchen counter when you’re entertaining a large party of fifteen. It’s great for a summer barbecue in the backyard too. It will make tailgating more fun. If you live in an apartment that doesn’t let you have propane or charcoal grills that smoke up the kitchen, this electric grill could be an excellent landlord-friendly option for you. Here’s a look at the features of the George Foreman GGR50B, that makes it one of the best indoor electric grills. Setting up: The George Foreman grill is easy to set up. The removable stand is easy to attach to the bowl of the grill. There is a teflon-coated grilling plate that fits into the bowl. A large dome-shaped lid goes on the grill. The set up for the grill takes a few minutes. There is a temperature controller attached to the power cord that can be plugged in when you want to use the grill. The grill has an attractive silver and black finish that makes up for its top-heavy appearance. The grill alone stands at six inches height without the lid. When it’s set up on the stand, it stands about 2 ½ feet high, minus the domed lid. The pedestal is quite sturdy for when you want to cook. But be careful when there are children around, since the design is a little top heavy. Also, if you don’t have a convenient socket available, you may find the cable a little short and may have to use an extension. Good heating action: The grill heats up quickly and gets ready to cook in a few minutes. To use it after assembly, all you need to do is plug in the grill. The temperature controller gives you five heat settings. The low setting will help keep food warm. The highest setting is for searing steaks. Set your temperature and the grill will heat up in about ten minutes. Meanwhile you can prep the foods to go into the grill. The heating elements in the grill are well-placed to allow as even heating as possible on an electric grill. The large domed lid has vents that helps to keep the hot air circulating. This heats food evenly, and is particularly useful when cooking a whole chicken or a large roast. Large nonstick cooking surface: The grill has a supersized circular cooking area of over 240 square inches. This means you can fit about eight extra-large hamburgers on the cooking surface, or vegetables and smaller cuts of meats for a hungry group of about fifteen. The nonstick surface means that you need a minimum of additional oil or cooking spray. The surface is designed with a small slope. This drains oil through channels into a drip tray below the grilling plate. Easy cleaning: The grill is easy to clean. Just remove the temperature control and you can wash the lid as well as the grease tray in the dishwasher. For easy cleaning, carefully wipe the grilling surface with a damp paper towel while the grill is still comfortably hot. The grill plate is not immersible, but the top can be sponged or wiped down with paper towels and cleaning sprays that don’t damage non-stick coatings. 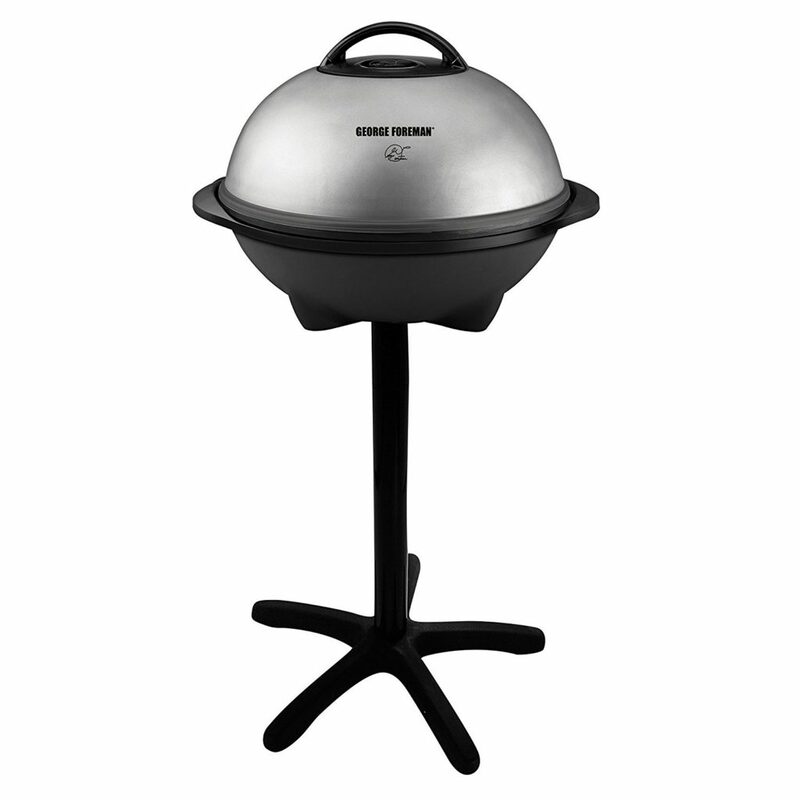 This is a very popular indoor/outdoor grill that you can use on your patio as well as on your kitchen counter. It can help you cook up juicy steaks and grill vegetables to perfection on barbecue night, without a lot of added oil. The grilling plate offers even heating. It has a thoughtful lid design that further uses hot air to perfectly grill seared meats without drying them out. You’re not tied down by the weather on days you want to enjoy a barbecue. It’s great for apartment balconies too. Overall, this grill is an excellent addition to any kitchen where there is a lot of entertaining. American household name and home appliance manufacturer Hamilton Beach has a line of affordable indoor grills that apartment dwellers can use without smoking up their kitchen. This indoor flavor/searing countertop grill with model number 25360 is great for entertaining inside the home when the weather threatens to ruin the party. The unit has a clamshell design that acts like an outdoor grill. It doesn’t have heating elements in the lid. It has an attractive stainless steel exterior and is easy to use and clean. Here is a closer look at the features that this grill offers. Setting up: The grill is easy to set up. The removable lid is a snap to remove and replace into the unit. The grill plate fits easily on the bottom and the drip tray slide under it. The grill operates at 110 volts and has an adjustable temperature control that lets you set the temperature between 200 degrees and 400 degrees. There is also a Searing feature, which lets you achieve a higher temperature for quickly searing meats before dialing it down and cooking on low heat. Another bonus is the manual that comes with clear cooking instructions, with recommended grilling times for different foods. Reasonably large nonstick cooking surface: The cooking surface is reasonably sized and can comfortably fit three to four chicken breasts or stakes at a time. The drip pan is also large enough to collect all the grease conveniently without any spillage. The non-stick cooking surface will work best with a slight spray of oil, which will make it easier to clean. Overall, the nonstick surface is durable and doesn’t need a lot of added oil. The grill has an “open grate” design, which helps to provide a grilled flavor on meats. It helps heat to circulate better and fat drips off immediately. There is also a small section on one end that is not open to the bottom. Vegetables can be placed here so that they don’t fall into the bottom. Good heating action: The grill needs to be preheated before food is placed in it. Preheating is quite quick, and takes only a couple of minutes. You can use the grill with the lid off as an open grill, in which case you’ll find it doesn’t smoke a lot. You can also use it with the lid on to keep grease and splatter contained, and for faster and more even cooking. Indoor electric grills may not be able to match the charcoal flavors of outdoor grills and open flames. But this Hamilton Beach grill achieves temperatures that give food flavors very similar to that of outdoor gas grills. Reasonably easy to clean: If you’re someone who likes to throw everything into the dishwasher after cooking, you may be slightly pleased with the Hamilton Beach grill. The lid and the grilling plate are dishwasher-safe. However, you need to wait for the parts to cool down before putting it into the dishwasher. It may be easier to get all food stains off the grill ridges if the plate is wiped down with a damp towel while it is not too hot to the touch. Dual temperature controls: The grill lets you choose your heating controls in two ways. You can either dial in specific temperatures like you would do in an oven. Or you could use preset low to high settings. This popular budget grill is popular for a reason. It is easy to use, convenient to store, sits on a countertop without a large footprint, and is reasonably easy to clean. If you live in an apartment and can’t enjoy an outdoor charcoal grill or even an outdoor gas grill, then this compact electric grill is an excellent addition to your kitchen countertop. It is best for small families or two-person families. With its searing ability, you’ll find it gets meats almost as juicy and flavorful as restaurant quality steaks. If you haven’t used a Hamilton Beach grill, you can try this indoor searing grill without a second thought. It is portable enough to carry wherever you want as well. Australian appliance brand Breville is known for its stainless steel appliances, that have become household names in the US and Canada. This contact grill has a classic clamshell design that opens up into an open grill when you want. Or you can use it doubled up as a press. This versatile design lets you grill a lot of different types of food. In addition, the flat and ridged plates that comes with this model makes it very convenient for creative cooking. You can grill traditional foods like chicken or hamburgers, and you can also get creative with Panini and sandwiches. The flat surfaces are great for whipping up breakfasts of pancakes and eggs. If you’re looking for a quick and convenient appliance to whip up grilled breakfasts, lunches and dinners, this Breville model is a good option, even if it is priced on the higher side. Quick setup: It is quicker to set this grill up than most other grills. Assembly can take less than a couple of minutes. The griddle and grill plates are quick to remove. The drip tray slides off easily, and the sliders on the handle are easy to adjust for the six height settings that help to protect food from being squished. The plates release at the press of a button. Versatile grill: The BGR820XL is a large grill that lets you use it in multiple ways. In its closed, clamshell form the unit takes up a space of 14 inches by 14 inches. It won’t take up a lot of your counter area when you’re cooking your everyday breakfast or lunch. In this form, you can use either of the removable non-stick grill or flat plates for cooking. The electric elements are embedded into the plates. This design feature helps with more even heating as well as makes the unit easier to clean since you don’t have to worry about getting water into the heating sockets. The ridged grill plates can be used for grilling. There is a tilt feature that helps excess fats to drain off into the drip tray. You can also set the unit fully flat for griddling eggs, pancakes and other foods. The unit has a slider to adjust the hinge for thick Paninis and sandwiches. The die-cast handle is also a convenient sandwich press-style handle for ease of use. With the clamshell open, you can use the unit as a half-grill and half-griddle to feed a large group of people. Reasonably good heating action: It is not easy to achieve even heating in electric grills, and like most grills, there is a temperature difference between the two corners on this one. But the unit achieves the desired temperature quickly, and gives you good-tasting hamburgers and any foods that don’t need delicately accurate temperatures. The Element IQ feature is used to achieve quick heating. The digital display tells you the temperature and time needed for cooking. You can adjust the temperature dial between low and searing temperatures from 310 to 450 degrees F, and adjust the time with another dial. There is a separate Panini heating mode for your sandwiches. Overall, the grill gives your foods professional quality browning and you can create restaurant quality ‘crisp yet juicy’ meats with this grill. Easy to clean: Cleaning is quick and easy too. The PFOA-free nonstick plates are quick to remove, and can go in the dishwasher along with the drip tray. But as with most nonstick griddles and grill plates, it is best to give them a wipedown with a damp towel while they are still comfortably hot. The model doesn’t come with any scraper, but this is common with most electric grills. The Breville grill is best for cooking up quick meals that you think up impromptu. It is versatile, so there are a lot of things you can do with it. It’s great for grilling hamburgers and other simple foods quickly. A frozen hamburger patty cooks up in less than four minutes because of its smart technology. It is sturdy, easy to clean and attractive on the kitchen counter. It is not perfect, but it has many strengths to make up for its few weaknesses. Since there is only one griddle and one grill plate that comes with the unit, you will have to flip hamburgers to get grill marks on both sides. But separate griddle and grill plates can be purchased if you want. This is a disadvantage that many customers will recognize, but the model’s benefits make up for it. It has some of the fastest cooking times of comparable countertop grills. It is also useful for the unit to recognize frozen meats and cook accordingly. Overall, this model gets you what you pay for. It browns professionally, and likely to last you a long time. Teflon cookware brand Tefal and its new branding of T-Fal brings us this affordable indoor grill for our busy lives. The highlight of this grill is its automatic features. It is designed to cook according to the thickness of the foods that you place in it. It also automatic cooking programs, indicator lights, separate cooking modes for frozen items and manual settings. The model comes with die-cast aluminum, which is cheaper and lighter than cast iron but still gives you the satisfying weight and even heating that you want. Let’s take a look at the features that makes this unit so popular and good to use. Convenient structure design: The first thing that strikes you about the T-fal grill on the counter is that is designed to be easy to use. The clamshell unit sits on your counter with a slight slope to make it easy to drain off excess grease from your food. The handle is generous and easy to lift and press down the lid, though it does get a little hot when cooking. The buttons and controls on the appliance are large, visible and easy to understand. There are indicators with labels to tell the user what the various lights indicate. Cast aluminum plates: The aluminum plates in the T-fal are die-cast. This means the plates are non-stick and easy to clean. They can be placed in the dishwasher, along with the drip tray. Cast aluminum for cooking is perfectly safe and acceptable, and only poses problems for dairy products which are reactive. Both the base and the lid are fitted with removable plates in the classic clamshell design. The ridges are vented for good heat circulation, to ensure even cooking and better drainage of fats. But the vents aren’t too large that vegetables will fall through the plates. The plates are generously sized so you can cook about four large chicken breasts or four steaks at once. Automatic cooking programs: The grill offers six different automatic cooking programs that make cooking as easy as a press of a button. The six programs are for quick-cooking of burgers, sandwich, poultry, sausage, fish and red meat. When you select a food type, the T-fal automatically adapts its heating cycle and cooking process to the type of food. You can further cook either in the frozen food mode, or in the manual mode. The mode for frozen foods means that you can simply pull meats out of your freezer and put it straight into the T-fal grill, without worrying about thawing or cooking properly. It is not easy to cook frozen meats properly on standard electric grills, so this feature is a bonus on the T-fal. The unit also has an excellent dial with colored labels that tells you whether your steak has been cooked to rare, medium or well-done. The labels make it easy to cater to preferences. If you prefer your steak rare while the rest of your family likes it well-done, simply remove your steak when the dial reads ‘rare’, and let the other steaks continue to cook. Another feature of the unit is that it adjusts its cooking process to the thickness of the food. Overall, the easy features makes the T-fal a standout in its category. Ease of cleaning: The non-stick plates are easy to remove. The grease tray is generously large and protects your kitchen counter from a mess. To clean, simply remove all the used grill parts and put them in the dishwasher. It also helps to wipe down the plates while they are still hot, before cooling them and placing them in the dishwasher. A little noisy while it cooks. This T-fal grill is very user-friendly and value for money. It is by no means a budget grill but it is sub-$100, and offers features that puts it in a different league from sub-$70 grills. The grill is functional, easy to use with many auto-settings and, and plenty of auto-cooking options. The sloped design of the unit means that it can’t open up into an open grill like some other units out there. But most people won’t miss the open grill feature since the clamshell design toasts buns, sandwiches, steaks and hamburgers to perfection, with grill marks on both sides. The large buttons and indicators makes it a great gift for grandparents and students. The grill makes it easy to improvise dinners without having to plan ahead. When you come back from a busy day at work, you can simply pull out frozen meats and vegetables from your freezer and grill it for a no-plan dinner that’s ready in minutes. Japanese multinational brand Zojirushi makes excellent open grills for Asian-style grilling as well as hamburgers, sausages, and any classic American barbecue meats and veggies. Thi particular grill is a super-lightweight model that lets you bring barbecue cooking indoors. If you live in an apartment and want to enjoy smoke-free open grill cooking for the whole family, this electric grill can fit the bill. The model is competitively priced, easy to clean and works well. It has sound design and the 1300 watt burner offers good heating action for a small electric grill. For the sub-$70 price, you really cannot get a better grill that does exactly what it claims to do. It can cook juicy steaks and veggies right on your table without smoking up your kitchen. Solid design: The excellent Japanese construction of the grill is visible in its design. The vents on the grill plate are well-spaced and well-sized. The grease from your meats are removed into the tray below almost as soon as they melt. The tray has a well-designed pull which you can get an easy grip on, which is not always the case with drip trays in electric grills. The base is plastic, but it is good quality plastic. Overall, the build is sturdy, and the handles and base are cool touch so that you can move the grill around while it’s still hot. Another important feature that many grills miss is safety. Since it’s a tabletop grill, you want to make sure that it doesn’t start heating accidentally. This Zojirushi grill is built to make sure that it doesn’t heat up unless it has been installed correctly. The attention to detail in the little mechanical parts that hold the plates together is evident. Large and high quality nonstick cooking surface: The grill plate is large enough to cook for the whole family, measuring 12.5 inches by 9.25 inches. It can fit two large T-bone steaks along with some vegetables. It’s also great for cooking everything from hamburger patties, to chicken, to steaks, to fish fillets. The circulating air through the vents means that the food is cooked evenly, unlike a skillet or a griddle. The high-quality non-stick coating makes it easy to cook delicate foods like fish without having it stick to the surface. It is also possible to cook eggs and pancakes on it. The grill doesn’t get as hot as an outdoor gas grill. This means it can be difficult to cook thicker cuts of pork and other tougher meats. But it is ideal for cooking at a lower heat for a longer time. A little experimentation with different types and cuts of meats and seafood will help you maximize the grill’s potential. Easy to clean: The nonstick coating on the grill plate makes it easy to cook without food sticking to the plate and making stains. The plate is not dishwasher safe, but the drip tray can be removed and placed in the dishwasher. The grate can be cleaned in the sink. But as with most grill plates, wiping down after each use helps to keep cleaning to a minimum. The grease tray is the same size as the cooking plate, which means that there is no spillage on your kitchen table. Even if you cook thick steaks, the tray should be enough to contain the grease drippings. This is just as well, since the tray cannot be removed during cooking. The tray is large enough to hold about five cups of liquid. It also doesn’t heat up too much during cooking, which prevents the drippings from burning and being harder to clean. The Zojirushi grill is simple, sturdy and well-designed. It is excellent for cooking chicken, steaks, fish, vegetables and burgers indoors, when you don’t want to share the apartment grill and don’t have a patio. It’s not a grill for entertaining, but for the family’s everyday meals. It’s excellent at removing excess grease. The non-stick plates are high quality and durable. Chicken, seafood and steaks are cooked perfectly. Though hamburgers may take a little longer to cook than on other high temperature grills, a dome lid placed on the grill will speed up the process. In fact, the product would have earned full marks if it had come with a lid. But as it is, the Zojirushi CC15 indoor grill is an excellent buy that is fully worth what you pay for it. So now you have the choice of buying any of these best indoor electric grills, make your choice carefully considering all the factors, pros & cons mentioned in this article or continue reading the buyer’s guide to clear all your dobut’s, if you have any. Are you looking for the best indoor electric grill out there? Not everybody has enough space in the backyard to invest in an outdoor grill. And needless to mention, it is a great activity to do with friends and family. Want to do grilling and weather doesn’t permit? Fret not! All you need to do is invest in an indoor electric grill and you are good to go. Indoor electric grills offer quality grilling experience to the users and are at par with outdoor grills. Though they may not offer you the satisfaction of grilling under the sky, these can certainly compensate when you just can’t hold a BBQ party outdoors. Indoor grills are ideal for people who are fond of grilling. These are much cleaner when compared to traditional grills. These run on electricity and hence are easy to kick start. Electric grills are quite easy to clean as most of the parts are removable and can be cleaned in a dishwasher. If you are planning to get an electric grill, then here are some factors that you can consider before making any investment. Apart from weather constraints that prevent you from owning an outdoor grill, people who own condos and apartments and lack the luxury of owning a backyard or patio can opt for indoor electric grills. Owning an electric grill is not one and the same like owning a charcoal or gas grill. These do not impart a seared look to your delicacies. An electric grill doesn’t produce fumes. As the design is fume-free, it ensures that you would not have to bother about harmful fumes permeating through your home or making you sick. Propane or natural gas grills are quite expensive. Refilling gas tanks amount to additional charges. Electric grills on the other hand save a lot of money on fuel charges. Moreover, you would not have to bother about fuel running out during usage. Some residential buildings and apartments impose restrictions on what can be used and what cannot be for the safety of its residents. However, there are no such restrictions on owning an electric grill. This means that you can grill meat from the convenience of your home whenever you want to. An electric grill promotes nutrient preservation. Grilling meat slowly preserves the nutrients thiamine and riboflavin. These vitamins form an integral part of a healthy diet and are usually lost during cooking. If you are on a low-fat diet, then you will certainly benefit from grills that don’t absorb any kind of fat. When food is fried, fat gets absorbed into the meat. However, grilling is quite different and flavors the delicacies. There are three different kinds of indoor electric grills. These are more commonly used for grilling sandwiches. These are not just limited to making sandwiches but can also be used to cook meats, grill vegetables and in making souvlakis. A closed top grill is ideal for these purposes as it catches the excess grease that drips from the grill and ensures easy cleaning. These resemble outdoor grills more or less. These permit you to roast ribs and grill steaks in the same way as you do with outdoor grills. These are also referred to as clamshell grills and are more of a hybrid that comes with different grilling options. These can be as a sandwich press, for cooking steaks and for grilling cheeses. Choosing a perfect indoor electric grill can prove to be a daunting task. This is because there are different brands available in the market offering unique features. Some grills come with stands while some come with grease catching mechanism thereby making the cleanup quite easier. Here are some other aspects that you can consider while looking for that perfect indoor electric grill. Traditional grills come with a lot of cooking space. Most barbecues can hold enough food items to feed a group of family or a small family. Indoor grills are available in different sizes. You obviously cannot get an indoor electric grill that matches the depth and size of a barbecue as it is going to consume a lot of space in your kitchen. Standard grills are not even countertop friendly. Although bigger grills are better, they would consume a lot of space. Make sure to consider the size options that you can accommodate in your kitchen before actually purchasing one. Small families can opt for countertop models that are relatively small when compared to other grills. These cannot be used outdoors for hosting parties. You need to consider the number of people you would usually cook for in order to decide the size of the cooking surface that you must opt for. There are different features offered with indoor electric grills. Make sure to strike a fine balance between ease of use and complexity along with the size and price of the grill that you would be opting for. Regular grills can wreak havoc if used indoors because of the grease and the smoke emitted. If you are looking for cleanliness, then you need to rely on electric grills which are the cleanest when it comes to grills. Make sure to purchase a grill that leaves the least residue. You would want to avoid a grill that smokes a lot. Grease catcher is a must if you do not want to spend hours on cleaning up after the party. Using an indoor electric grill would obviously want to make use of a fuel. Electricity is the cheapest and cleanest fuel to opt for while using indoor grills. Do look into the power consumption of your grill if you don’t want your electricity bills to skyrocket. Keeping a tab on these features will help you pick the right electric indoor grill that would not just offer you delicious treats but will also keep your utility bill in check. Heat outputs in indoor grills are usually dependent on the kind of model that you are utilizing. Most of the grills yield over 350ºF which is hot enough to cook most of the grill recipes. Some electric grills come with temperature settings that range in between 400 to 600ºF. This offers you a better control over the delicacies that you are cooking. Contemporary indoor electric grills are available in numerous attractive colors to blend well with the theme of the kitchen. The best brands in the segment make sure to combine looks with the ease of usage. This would make a perfect fit in modern kitchens. These are fabricated to be durable in the indoor environment. Of the different kinds of indoor electric grills available, the clamshell is the most popular design. Both the bottom and top surfaces of these grills have been designed for sandwiching food appropriately. This eliminates the need for any flip while grilling. It also cuts down the cooking time required for crafting delicacies. A little bit of effort is needed for cleaning these designs. There are some units that resemble a traditional griddle which are used on a burner or a stovetop. An electric girdle has its own heating source that permits you to grill from anywhere, provided there is a power outlet in the vicinity. The only drawback is that the glass lid in this design causes the meat to steam in its own juice rather than grill to perfection with altered flavors. The vertical barbecue grill is yet another popular indoor electric grill. It is the most efficient and easy to use grill. You would barely come across any turning or toppling in this grill. The best thing is that food would be cooked evenly with uniform heat distribution. All you need to do is to is string the meat, fish, chicken, vegetables and sausages on the pins and axes to craft lip-smacking delicacies. Focus on the overall performance, durability and appearance for a great indoor electric grilling experience. Here are the additional features that you can consider while purchasing an electric grill. Several electric grills come with an inbuilt temperature gauge so that you can keep a tab on the temperature at which you are cooking your delicacies. Different gauges are available on the grills that permit you to adjust the temperature. If the model that you are considering doesn’t come with a temperature gauge, then you can opt for models that come with indicator lights. These will indicate you the right time for cooking. You need to look into the temperature that a grill can attain. This can play a major factor when it comes to decision making. You would want to ensure that your grill at least attains 600ºF. Although you can cook at lower temperatures, your recipes are going to taste incredible at higher temperatures. Your grill gets better sear and is cooked evenly at higher temperatures. The higher setting permits you to cook food at a quicker pace if you do not want to spend a lot of time on slow cooking your meat. Removable grates and plates are going to make your task easier as these can be cleaned in no time by putting them in a dishwasher. You will not have to manually scrub the grill setup for cleaning. The detachable grill parts can also be cleaned in a sink in no time. Some grill models do not come with removable plates, which make cleaning quite difficult and awkward. Hence, make sure to look into the designing carefully before investing in any indoor electric grill model. Contact grills with floating hinges are one of the best indoor electric models available. These hinges connect the lid of the grill onto the food for providing a uniform cooking surface. Floating hinges are ideal for those who wish to grill sandwiches and not squish it. These just lay on the top of the bread thereby heating it evenly. This feature is something that should not be ignored especially if you are opting for an indoor electric grill. It is vital to know where you would place the electric grill and whether there is any electrical outlet nearby. If there isn’t, then you will have to consider an outdoor electric grill model with an appropriate cord length. You need to place your indoor electric grill in a safe and comfortable position. There are a lot of different models available when it comes to indoor electric grills. You may find it a cumbersome task to pick the most appropriate model as per your requirements. Features such as grates, floating hinges, grates and temperature control can be a deal breaker while looking for an indoor grill. You should not overlook how you would be using the grill and what you plan on cooking. You need to carefully go through the different models available in the market in order to take an informed decision. You need to look for options that would be suitable for both professionals and amateurs. Look for indoor electric grills that would not prove to be a mess when it comes to cleaning. Indoor grills are ideal if you want to enhance your recipes. You will be able to craft all your delicacies at the right temperature when you opt for a perfect indoor electric grill. Grilling imparts a distinct flavor to your recipe. This is something that you cannot achieve without a grill. Electric grill would be an ideal choice for you if you just cannot wait to fire up your grill for imparting smoky flavor to your favorite recipes. Electric grills can be used from the convenience of your homes without any hassles. You do not really have to step outside to grill your favorite dishes. You just need to get one of the best indoor electric grills for all-season grilling.